One in three households have had a mouse in the house. Mice aren’t just a nuisance, they can cause expensive damage and spread dangerous diseases. Getting rid of mice quickly is essential for a happy, healthy home. Even though mice are a fairly common problem, there hasn’t been an ideal solution. Mouse traps, glue boards and rat poison all come with health and safety risks. If you have pets or young children, the possibility of accidental poisoning is alarming. You may also have concerns about curious paws or fingers finding their way into a snap trap or getting stuck on a sticky pad. If you are looking for a humane option, those methods simply won’t work. Perhaps the biggest problem with these mouse control methods is that they only address the situation after you’ve had a rodent run in. Wouldn’t it be better if you could keep mice out instead of catching them once they’ve moved in? More and more families are switching from conventional products to natural solutions. Many household products are made with harmful chemicals. As people discover the risks associated with these hidden poisons, they’re opting for natural alternatives instead. Plenty of DIY remedies for getting rid of mice exist on the internet, ranging from placing mothballs or dryer sheets around the house, to using cotton balls soaked in peppermint oil. What all of these ideas have in common is that they use fragrance to prevent and repel mice. You may be surprised to find that natural products can do a better job than their conventional pest control counterparts. Unlike traps and poisons that are used in reaction to a mouse infestation, scent based rodent repellents actually prevent pest problems before they begin. The reason this is so effective is because rodents have poor eyesight, but a strong sense of smell. Rats and mice use their noses to find food and sense danger. If a fragrance overwhelms their little noses, they will avoid the area. Why choose Stay Away® Mice? Not all scents are created equal. Although there are many different DIY solutions for mice, few come with instructions or guarantees. Stay Away® offers an award-winning line of proven pest repellents for household pests. For years, people have been turning to Stay Away to prevent ants, beetles, moths and spiders while protecting their family and home. 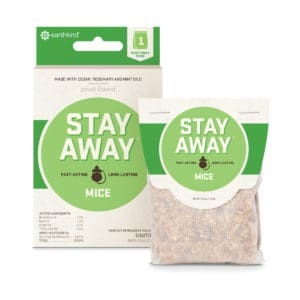 Stay Away Mice is the newest addition to this line of natural products. Unlike other DIY solutions, Stay Away Mice has a precisely concentrated unique blend of essential oils that are proven effective for getting rid of mice. The active ingredients are a combination of rosemary, spearmint and cedarwood oils. The instructions for using Stay Away are clear and easy to follow: Remove the plastic overwrap and place pouch in any area showing signs of rodent activity. Use one pouch per 125 square feet for up to 60 days for prevention, and increase usage as much as one pouch per 25 square feet in heavily infested areas. Like all of EarthKind’s products, Stay Away Mice comes with a 100% satisfaction guarantee. Hello. I would like to thank you for your products, specifically the Fresh Cab for mice. My mother(89 yrs young) lives independently over our garage and those pesky mice were a constant problem for her. We’ve tried mouse traps and mouse sticky pads and the ONLY method that keeps the mice out of the garage (and thus out of her apartment above it) was Fresh Cab. I’ve been using that for the last 2-1/2 years and IT WORKS! Since I no longer can find it in stock anywhere (even at your web site), I purchased the alternative product Stay Away – no luck. My mother is back to fighting those pesky mice – PLEASE let us know when your web site has Fresh Cab back in stock! Thanks again – and my mother will thank you when we can get the product once again. Thank you for the kind words! So sorry to hear Stay Away Mice didn’t get the job done for you. Please contact us by phone (800)583-2921 M-F 8-4:30 EST or email customercare@earthkind.com to see if we can find a way to make it right. Why can I not find Fresh Cab online or in stores ? I just want to keep rodents and other pest away. Will my dog have a reaction to products ? Can you recomend something ? Our products are made with botanical oils and plant fibers instead of harmful chemicals. 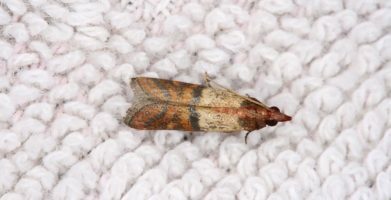 They are scent-based repellents that will make pests avoid the area. Although there should be no adverse effects on people or pets, keep an eye on your dog for any change in behavior since dogs do have a keen sense of smell. Feel free to call or email with any additional questions. Unlike other DIY solutions, Stay Away Mice has a precisely concentrated unique blend of essential oils that are proven effective for getting rid of mice. The active ingredients are a combination of rosemary, spearmint and cedarwood oils. The instructions for using Stay Away are clear and easy to follow:  Remove the plastic overwrap and place pouch in any area showing signs of rodent activity. Use one pouch per 125 square feet for up to 60 days for prevention, and increase usage as much as one pouch per 25 square feet in heavily infested areas. string(47) "A New Way to Get Rid of Mice:  Stay Away® Mice"